The rate of food insecurity in Latino households is almost one in five, according to a study this month from the National Council of La Raza, a Hispanic civil rights and advocacy organization. Among the report’s key findings is that nearly one in five Latinos (19.6%) suffers from limited or lack of access to nutritious food each year, compared to 12% of all Americans. The report identifies a number of areas that contribute to this figure, as well as examines the links between hunger and problems such as obesity and physical and mental health among children. The Washington Post article about the report quotes an old family friend, Beatriz Otero, who has led a remarkable group of bilingual charter school and early childhood education programs in Washington's Columbia Heights neighborhood. How good is online restaurant nutrition information? The NYC Board of Health decided recently to require calorie labeling prominently on menus and menu boards for some restaurants. Some readers might have overlooked this policy in the media coverage of the Board's simultaneous ban on trans fats in restaurants (see earlier post), but the labeling rule may in fact be more important. A curious feature of the new labeling rule is that it seems to apply only to restaurants that already make calorie information available, and not to restaurants that currently fail to provide nutrition information online. Clearly, the Board's purpose was to address chain restaurants with standardized products, because these chains clearly know the nutrition characteristics of their products and will have a comparatively easy time posting the information. Still, it would be ironic to allow restaurants to evade the menu labeling rule simply by refusing to provide nutrition information elsewhere as well. This raises the question: how good is restaurant nutrition information online? For myself, because I am interested in more nutritional features than can be listed on the menu board, a good online database may be even more important. Margo Wootan and Melissa Osborn took a look at this issue in the American Journal of Preventive Medicine last February. This fall, starting with their paper, Sivakumar Chandran and I compiled this Excel sheet (.xls) with current notes about the online nutrition information provided by the leading chains, as identified by the QSR Top 50 list. Although Fast Food Facts and a couple other online sources provide excellent data bases for a large number of chains, we focused on the quality of direct information provision by the company. The high quality and ease of use for the top several chains is notable. Here, in QSR's order, is McDonald's, Burger King, Wendy's, Subway, Taco Bell, and Pizza Hut. The worst non-discloser among the top 20 chains appeared to be Quiznos. That's great for Quiznos. Now that restaurant chain may not be subject to the NYC menu board rules either. Why not patent a product that tastes and smells like manure that you can spray on your food? That'll deter you from eating. Or how about a clothespin that you can pinch your nose with while you eat? That would probably numb your sense of smell. Wow, that really is the stupidest weight loss drug ever! This society is out of control. How did your district do on school wellness? School districts around the country worked this year to pass "school wellness policies," establishing guidelines at the local level for nutrition and physical activity. These new policies follow several years of hand-wringing about rising rates of childhood obesity and many more years of negative changes to school food and wellness practices: shortened physical education, junk food in vending machines, pouring rights for soda companies, branded pizza as a lunch entree, potato puffs as a vegetable, food company marketing in the guise of nutrition education curricula, and on and on. These changes sometimes seemed to "just happen," without having been established as policy by any particular accountable person or council. Although the 2004 mandate from Congress requiring school wellness policies stood in place of even more ambitious pro-nutrition policy options that Congress lacked the courage to adopt, this mandate did at least require local school districts to decide in public where they stand on the child wellness debates of the day. Now comes the challenge of figuring out what the districts decided. There are many thousands of school districts in the United States. No systematic collection system was established to organize district-level information about wellness policies. 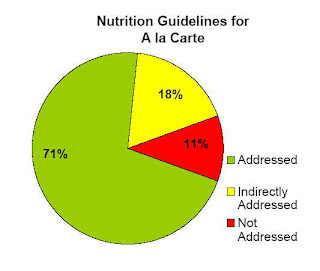 Fortunately, this month, the School Nutrition Association -- an advocacy group for childhood nutrition and in some respects a trade association for the school food service providers -- released a report summarizing the policy decisions for a representative sample of 140 school districts (.pdf) (data on a la carte policies excerpted below). This new report follows an earlier report this fall about the 100 largest school districts (.pdf). The results are summarized briefly in this press release. If you care about nutrition and wellness in your own local area, get and read a copy of your own local wellness policy. Here is a link to my town's policy (I served on the wellness policy committee and the later implementation committee until recently). Now, really for the first time, you can easily compare your district to other similar districts around the country. It almost makes me wish the parents here in Arlington had pressed even harder than we did for a vigorous pro-wellness policy. Guacamole dip with no avocado -- a food policy lesson in "standards of identity"
The guacamole sold by Kraft Foods Inc. ... calls for modified food starch, hefty amounts of coconut and soybean oils and a dose of food coloring [Note 12/21: slight correction, see comments]. At a time when trust in big business is low - and when the food industry, fairly or not, faces escalating concern over the epidemic of obesity in the United States - you would hope, and think, that the industry would go out of its way to avoid marketing practices that are even potentially misleading. Are there no rules about this sort of thing? You may be surprised that it is legal to call a paste "guacamole dip" if it has minimal amounts of avocado. In fact, the federal government does have such rules, called "standards of identity," for hundreds of food products. Here is a Food and Drug Administration (FDA) announcement last year about possible changes to these standards. Looking deep within the Code of Federal Regulations on this topic (see sections 130 to 169), I could find many related products, but no guacamole. I know you will be pleased to find that products that do have a standard of identity are required to have the nice simple ingredients you would expect. Dan Mitchell's New York Times column, "What's Online," today reviews the lively commentary on the Economist article this month, which criticized organic agriculture and other consumer movements. As for the claim that organic will take more land, this is entirely based upon the assumption that organic yields less and thus needs more land to farm. But the longest running study comparing organic and conventional methods, published in Science, found that organic agriculture has about 10 percent deficit in yield in grains. Several universities in the U.S. have found that deficit in the range of 4 percent to nil. Other studies have shown organic outperforms conventional farming in years of drought. Finally, the problem with conventional farming has been soil depletion through overuse of chemicals - something that India is now experiencing and one reason they are looking beyond the Green Revolution to organic alternatives. These numbers sound far more plausible than the yield penalty implied by the Economist. Fromartz's statistics do make organic agriculture appear a tad less efficient per acre than conventional agriculture. When readers think about organic farming, they should not imagine a weed-ridden backwards plot off the grid. Instead, they should picture fairly modern information-intensive production, which uses high-quality conventionally bred seed stock in place of GMOs, and which refrains from using certain chemical pesticides and fertilizers. Indeed, the very efficiency and recent modernization of organic agriculture has been so striking that it has become controversial within the movement. In addition to commenting, Fromartz also writes his own posts at Gristmill, recently linking to this interesting essay from Bob Scowcroft about long-term trends in organic agriculture. Although a comment on my earlier post questioned the relevance, the discussion of a small yield penalty for organic agriculture naturally makes me wonder what change in the food system would more dramatically improve nutrients per acre sufficiently to alleviate the land pressure on the world's rainforests. The foremost answer is to eat less meat. If you are vegetarian, you're all set (although my colleagues at the nutrition school will remind you to take steps to ensure adequate micronutrients). If you are not vegetarian, you can easily to pick an amount of meat that exceeds your nutrition needs and is still far less than the average American consumption level. A nonprofit scholarly journal's editor has asked me for a suggestion for a photograph to use on the cover of an upcoming issue. The topic is related to economics and nutrition, and she suggests something about a food transaction. Her instructions say, "Generally a simple photo works best. It needs to be of high enough resolution for printing at the size used. (For example, we would need the file supplied at 300 dpi with a width of 8.375 inches, or proportionally higher dpi if provided at a smaller size--we can adjust the size as long as the resolution is there.) A copyright release is also required." If you have a suggested photograph, please send with a suitable price quote for nonprofit use to the email address in my Blogger profile. Thanks! Your child's doctor is a balanced and trusted source of wisdom, right? Advertising is a pervasive influence on children and adolescents. Young people view more than 40,000 ads per year on television alone and increasingly are being exposed to advertising on the Internet, in magazines, and in schools. This exposure may contribute significantly to childhood and adolescent obesity, poor nutrition, and cigarette and alcohol use. Media education has been shown to be effective in mitigating some of the negative effects of advertising on children and adolescents. The Center for Media and Democracy's PR Watch blog post reported this development with the headline, "Doctors seek ban on junk food ads." I couldn't find quite such a broad advertising ban in the recommendations, but I might be mistaken, and in any case it is a fine point. The recommendations do call for a ban on in-school advertising (such as the sinister and fortunately beleaguered Channel One TV project). The pediatricians point out that commercial speech targeting children does not really deserve serious First Amendment protections, as political speech does. Moreover, the word "ban" shows up in favorable comments about progressive pro-child policies in other advanced countries, so the pediatricians clearly have a strong policy response in mind. They also call for federally funded media awareness education to make children less susceptible to advertising influences in the first place. In related news, the Center for Science in the Public Interest (CSPI) this month praised the World Health Organization's most recent conference report on advertising food to children (.pdf) around the world. A fascinating side story has been the efforts of the Federal Trade Commission (FTC) to find out what advertisers' own research shows about the influence of their advertising. What little I know about that research comes from a presentation I once saw by Juliet Schor, whose related book is Born to Buy: the Commercialized Child and the New Consumer Culture. Reacting to the power and creativity of the consumer culture with politically unfeasible regulation and parental diligence is a little like attacking Frankenstein's creature with torches. One could find this assessment discouraging, but I don't. It causes me to reflect on what responses really do have "power and creativity" to match those of the consumer culture. This happy list is so long that it had better wait for another day's writing. Readers of U.S. Food Policy have been offering a wealth of thoughtful, informative, provocative comments lately. For starters, see all the topics with multiple comments on this front page, and then also see the conversations in the November archives. Reading these comments increases the fun of sharing these issues and links with you. Good timing, too. This month is the weblog's second birthday. Nonsense from the Economist: "Buy organic, destroy the rainforest"
The December 7 Economist claims that Fair Trade principles, organic agriculture, and local food are actually bad for the environment. As alternatives to these market-based movements, the magazine recommends political action to support government responses such as carbon taxes and abolishing subsidies. I won't criticize carbon taxes or praise subsidies here, but I do think the respected magazine overstated its case and failed to achieve its own typically astute market-centered and yet progressive policy insight. Buy organic, destroy the rainforest. Organic food, which is grown without man-made pesticides and fertilisers, is generally assumed to be more environmentally friendly than conventional intensive farming, which is heavily reliant on chemical inputs. But it all depends what you mean by “environmentally friendly”. Farming is inherently bad for the environment: since humans took it up around 11,000 years ago, the result has been deforestation on a massive scale. But following the “green revolution” of the 1960s greater use of chemical fertiliser has tripled grain yields with very little increase in the area of land under cultivation. Organic methods, which rely on crop rotation, manure and compost in place of fertiliser, are far less intensive. So producing the world's current agricultural output organically would require several times as much land as is currently cultivated. There wouldn't be much room left for the rainforest. This is quite misleading. First, the journal must argue the case not just that organic agriculture is less efficient with respect to total inputs, which I find plausible, but less efficient with respect to land. Typically, organic agriculture involves more intensive labor and management inputs, which offset less intensive chemical inputs. The Economist should mention a source for the claim that organic agriculture is less efficient per acre. Until they do, I doubt it. Second, it is quite an omission to claim that organic agriculture's (unproven) land inefficiencies will harm rainforests, without mentioning that growing feed grain for meat is vastly more wasteful. A typical contemporary post-hippy suburbanite's granola diet -- organic food and smaller amounts, if any, of animal products -- is not the cause of deforestation. In protecting produce supplies from the dangerous form of E. coli that has caused recent outbreaks, one problem is that produce consumption doesn't offer a final "kill step" in the same fashion as cooking meat. In response, growers could seek stricter FDA regulation of production processes, but that would take many months at the very least. Alternatively, growers could establish a marketing order enforced by USDA's Agricultural Marketing Service. These marketing orders aren't customarily used for food safety purposes, and they leave a higher level of responsibility on the industry's shoulders, but they would be quicker to implement. The patchwork of federal and state regulations that is supposed to ensure food safety has become less effective as the nation's produce supply has grown increasingly industrial. Three months after the spinach scare, there is no agreement on what should be done to reduce health risks from the nation's fruits and vegetables even as each episode of illness has heightened a sense of urgency. Over the past 40 years, the industrialization and centralization of our food system has greatly magnified the potential for big outbreaks. Today only 13 slaughterhouses process the majority of the beef consumed by 300 million Americans. And the fast-food industry’s demand for uniform products has encouraged centralization in every agricultural sector. Fruits and vegetables are now being grown, packaged and shipped like industrial commodities. As a result, a little contamination can go a long way. The Taco Bell distribution center in New Jersey now being investigated as a possible source of E. coli supplies more than 1,100 restaurants in the Northeast. While threats to the food supply have been growing, food-safety regulations have been weakened. Since 2000, the fast-food and meatpacking industries have given about four-fifths of their political donations to Republican candidates for national office. In return, these industries have effectively been given control of the agencies created to regulate them. After announcing last February that the federal government's National Pork Board would purchase the "Other White Meat" slogan from the private National Pork Producers Council (NPPC) for $60 million, USDA's Agricultural Marketing Service at first refused to share any information about the appraisal on which the sale price was based (see our post last June). Recently, in response to my appeal of that refusal, USDA has shared partial photocopies of several documents, with key financial details blacked out. With these details secret, it is impossible for an outside observer to judge whether the sale has an "arm's length character." The sale funnels $60 million from the National Pork Board to the NPPC, which does not have to perform any work in return. This sale was announced by the National Pork Board last February and covered in the agricultural press. I filed my first Freedom of Information Act (FOIA) request in April, which USDA denied on grounds that the information about the appraisal was "pre-decisional." I appealed in June to the administrator of the Agricultural Marketing Service and in October received the partially censored information provided here in .pdf format: (1) a letter from the National Pork Board's president and CEO to USDA, (2) a sale proposal from the National Pork Board, (3) information from a Mark H. Williams company about the appraisal for the sale price (this company appears not to have much of a web presence that I can find), and (4) a decision memorandum initialed by the acting Under Secretary for Agriculture. The National Pork Board is one of the largest federal checkoff programs (see here for more information about these programs and their nutritional implications). Using the federal government's powers of taxation, it collects more than $60 million each year in mandatory assessments from pork producers, and uses the funds for advertising and promotions, including the well known "Other White Meat" campaign. A majority of pork producers voted to discontinue the checkoff program in a 2000 referendum, but the NPPC subsequently convinced the administration to continue the program anyway. The NPPC is a private-sector trade association. It earns millions of dollars each year performing work under contract to the National Pork Board. The NPPC performs activities, such as lobbying, that are illegal for the National Pork Board. Once it starts receiving money from the sale of the "Other White Meat" brand, the NPPC may use the money without federal oversight. First, the existing value of this trademark asset was built in large part with checkoff money, so pork producers are apparently paying twice for the consumer awareness achieved by the slogan. Second, no buyer other than the National Pork Board would see this slogan as valuable, so there are no competing buyers to bid up the price. What amount do you think pomegranate producers would pay for the "Other White Meat" property? Third, the documents actually quote an appraised value of $36 million and a sale price of $34.5 million. This value is based on the costs of rebuilding an alternative brand from scratch over seven years. The much higher $60 million figure comes from scheduling payments of $3 million per year for 20 years, with an interest rate of 6.75%, which has the same present value as $34.5 million today. However, it is not clear that the $36 million in costs were similarly discounted to take account of the fact that these costs would also occur over several years. Though it is difficult to know for sure, given that the key information is kept secret, it appears possible that the deal is based on an accounting error that inflated the sale price by millions of dollars. 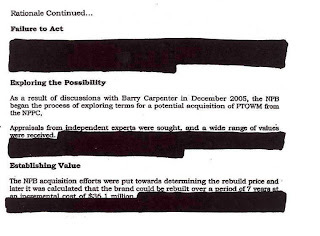 So you can see how important the information blacked out in the image below may be (see here for full .pdf file). Without this information, the deal fails pork producers, fails the public interest, and fails the smell test. New York on Tuesday became the first city in the nation to ban artery-clogging trans fats at restaurants, leading the charge to limit consumption of an ingredient linked to heart disease and used in everything from french fries to pizza dough to pancake mix. "I don't care about what might be politically correct and what's not," said Murray Bader, nursing a cup of coffee at Dunkin' Donuts on Tuesday morning. "I want to live longer!" Trans fats are found in baked goods, deep-fried foods, hard margarines, and to a lesser extent meats. They tend to raise the "bad" kind of blood cholesterol. They have few defenders. Even so, I must admit to fearing that this ban might overreach. Many products in the marketplace are bad for us. Only those products with the highest risks and no redeeming features should be banned. For those products that merely increase risks and have some merits, well-informed consumers can weigh the risk for themselves. Trans fats may be a borderline case. In your own reflection, ask yourself why trans fats should be banned in restaurants but not barbecue pork ribs? Why ban trans fats in restaurants but not butter-drenched baked treats? Or, following Kate at Accidental Hedonist, why ban trans fats in restaurants but not trans fats in properly labeled manufactured foods such as potato chips? Dr. Andrew Greenberg, whose research focuses on obesity and its complications, has been named to the newly endowed Dr. Robert C. and Veronica Atkins Professorship in Metabolism and Nutrition at Tufts University School of Medicine. The Atkins Foundation, established with a $40-million gift following Dr. Atkins' death in 2003, operates independently as a supporting organization under the stewardship of the National Philanthropic Trust, and is not affiliated with Atkins Nutritionals Inc. The press release emphasizes that other universities have installed similar Atkins endowed professorships. It points out that the donor, the Atkins Foundation, is not affiliated with Atkins Nutritionals Inc. These distinctions may be important. Do you implicitly prefer thin people? Do you subconsciously associate being male with stronger scientific aptitude? Do you harbor unrecognized prejudices on the basis of race or skin tone? Find out today with an implicit association test. The instrument design seems quite clever. The test doesn't take long, and it provides you with feedback at the end. Read more from a New York Times article yesterday about economics and weight status.